With Adelaide set to be a potential contender for a new Australian Contemporary Art Gallery, modern Artists from Australia have been in the spotlight lately. 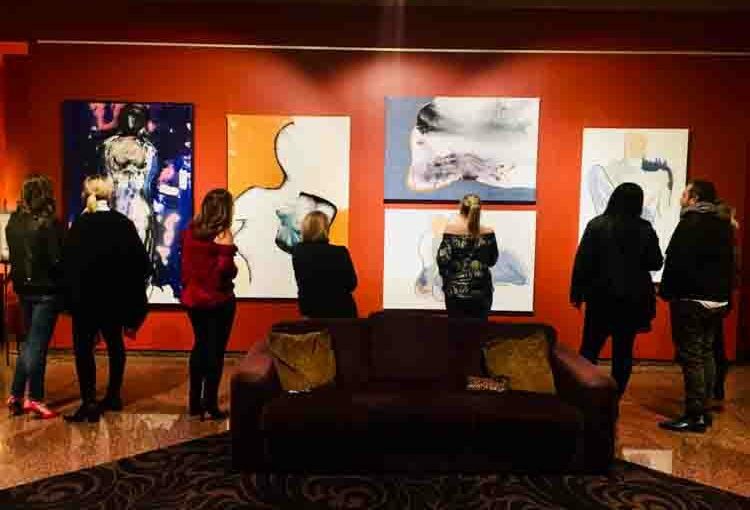 In particular a recent exhibition at the Intercontinental Hotel Adelaide has drawn attention to a local contemporary Artist from Adelaide, whose artwork is gaining the attention of the art world with art collectors both nationally and internationally already acquiring the beautiful works. The Artist Sarah Jane has a love of all things modern and contemporary and that shows through her style of work. Large paintings are her preferred medium in order to grab a real presence and voice and often her pieces will carry a message or meaningful story. Visiting the exhibition, the International guests and locals got a real sense of the energy from the pieces in the exhibition which were based on the lives of everyday people. Her simple philosophy is that art is not something just to hang on a wall, it should stir the senses and provide a sense of beauty and magic to the viewer stirring their emotions. So her message to collectors and clients alike is if a certain piece isn’t providing that then don’t buy it, just wait until the right Sarah Jane piece comes along. With art and culture such a big part of Adelaide lifestyle, it is great to have a local contemporary artist from Adelaide represent the modern on trend city that Adelaide is becoming. We look forward to seeing more great modern art going forward.